Footstool for a Fairy Princess! What a beautiful baby! So sweetly sleeping on a footstool made by my daughter-in-law Samantha and I for this wee little one, the one week old daughter of Samantha’s boss. The photographer, Nicole Hart of Portland, OR. added her deft touch and Ta-Da! Pure magic! 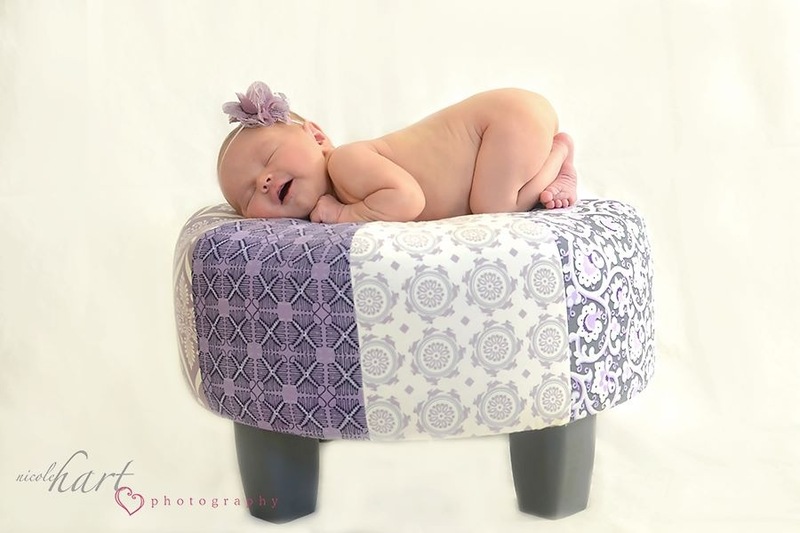 I’d love to see birthday pics of this baby with her footstool as she grows! May she have a happy and healthy life! Of course, you could make your own footstool in my next class at Piece By Piece Fabrics in Eugene, or order the kit if the distance is too far. Naturally you will add your own fabrics and finishing elements (feet and buttons). Included are 9 pages of pictures throughout the narrative instructions making it easy to be successful. I always have them on hand, so there is no delay. My next post (you will see later) is related to this, an idea using up the left-over fabric from the footstool, you’ll probably want to make that too!